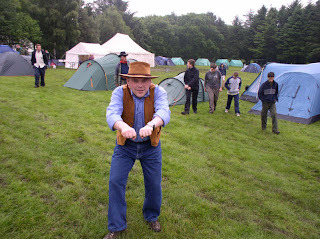 As part of the 2007 Centenary celebrations, Scottish Explorer Scouts are taking part in "The 12 Camps of 2007" - a series of events hosted by a number of different Scottish Areas. This weekend saw the turn of Fife area (and Fordell) to host an event, and over 60 Explorers attended supported by leaders from the local area and much further afield. During the weekend they had the opportunity to take part in many of the site's activities, as well as a number of off-site ones organised by the Area team. As well as the explorers, the site was busy with a number of other groups - Kennoway scouts, Bearsden Boys Brigade (who were camping jointly with a Danish group), cubs from Old Kirkpatrick and repeat visitors in the form of Belfast Guides, who arrived on saturday afternoon for a week-long camp. Despite a few transport issues on the Saturday (due to the security incident at Glasgow airport which also affected Edinburgh), everyone made it to the site eventually. Saturday saw numerous onsite activities being run by the 10+ staff in attendance - with the predictable bad weather appearing towards the end of the day. The staff then took part in a game of 'Hunt the Grass Sledge' for several hours after discovering that one of them had mysteriously disappeared after an activity session. Winner of this was Bob the Warden, who found the sledge the following day in a ditch near the caves - cold, frightened and lonely but otherwise OK. The Explorers were treated to a line-dancing extravaganza in the wet weather hall on saturday evening, and some went to extraordinary effort to dress up for the event, including event organiser Barrie. Due to a strict dress-code, the Fordell staff were unable to attend the event, but instead retired to the staff hut for a well-earned break after a busy day running activities. Despite a very busy Sunday, some of the staff were keen to continue with the redecoration of the staff hut in the evening, so commenced the much-needed task of painting the kitchen. At present there is no shortage of paint on site due to a recent sizeable donation, although the colour range does leave a little to be desired. However, after an extensive search a few tins of magnolia were sourced - watch this space for photographs of the makeover results.